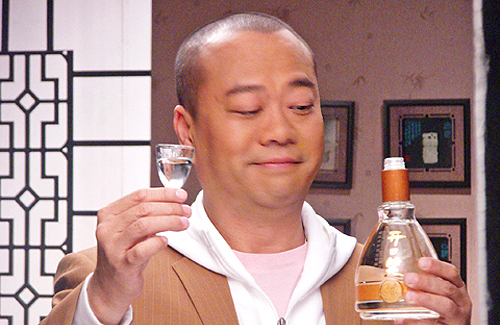 Above: Alcohol was rumored to have led to Bobby Au Yeung’s hospitalization. When news broke that 52-year-old Bobby Au Yeung (歐陽震華) was hospitalized for pneumonia and remained in the ICU, the incident shocked his friends and colleagues. Attending a Lunar New Year celebration where hard liquor flowed freely, it was quickly speculated as to whether Bobby had too many drinks causing him to slump into unconsciousness. On Monday night, Bobby and his wife, Rosanna Fu (傅潔嫻) met with Michael Tse (謝天華) and Michael Tao (陶大宇) at a friend’s house for a dinner gathering. Known for his low tolerance of alcohol, Bobby nevertheless had a drink. It was rumored that Bobby suddenly fell unconscious and was rushed to Ruttonjee Hospital in Wan Chai by Michael Tao and other friends. When Bobby arrived at the party, the other guests were already slightly drunk. Michael said that Bobby only drank a little due to the good cheer, and pointed out that Bobby has been tired due to filming long hours for TVB drama, Love Reverses Three Lifetimes of Fate <情逆三世緣>. Not wishing to disturb Bobby, Michael decided that he will visit Bobby when he is feeling better. He sent well wishes to Bobby’s wife, Rosanna, hoping his good friend will recover soon. Bobby’s former and current TVB colleagues were concerned about his health and wished him a speedy recovery. It’s probably the weather. It’s been pretty cold during new years here in HK. Liquids through your nose usually don’t cause pneumonitis (like taking a nosefull of water in a swimming pool) but his immune system has probably been weakened from the crummy weather, and the alcohol probably inflamed it further. I hope he’s okay and recover soon! He’s one of my favourite actors. yeah mine too. hope hes ok. When food or liquid gets wrongfully into the lungs(aspiration) it can cause the lungs to get infected and pneumonia then sets in.The probable treatment is strong antibiotics to get rid of the infection and fever. a friend of mine recently went through this bad experience and that’s how I learnt about it. I’m sure having the right physician Bobby will get through this problem. In future he will have to be very careful to swallow properly. Sure it is not alcohol poisoning? I hope u get well soon Bobby!! !